Water and beer are usually my first choices to accompany Indian or other curried foods. More often than not a long draught of quenching, ice-cold liquid is rather more important than the complexities of a fine wine. It all depends on the curry of course, and some dishes – subtly spiced and seasoned – would merit a carefully selected wine. I tend towards two extremes of style, opting either for a clean, fruity, low-acid white or a super-charged blockbuster red. The former can have a real palate-refreshing, cooling effect that enhances the exotic flavour of Thai or other Oriental curried dishes, the latter can work surprisingly well even with Indian curries, as long as the wine has the weight and power of flavour to stand up to the dish. This month I am recommending a trio of delicious white wines that all come from less well known grape varieties. There’s something for every taste however: two wines that fall into the unoaked, aromatic, fruity category and would be a suitable match for spicy recipes, and an oak-fermented Chenin Blanc which has some of the nutty, toasty character of fine Chardonnay. April’s red wine recommendations all come from California: a selection of wines that capture the bold, fruity flavours and strong personality of the Golden State. There are two examples of Zinfandel, California’s very own grape variety. Zinfandel is “big” enough to partner curried foods. It is probably a relative of the Italian Primitivo and has a similar profile of rich blackberry fruit with plenty of alcohol and spice. I’m really bowled over by Argentina’s Torrontés grape at the moment. This delicious example is beautifully perfumed with its lychee, summer blossom and rose-petal nose. On the plate the wine is taut and crisp with fine pear and apple fruit and a clean citrus finish. 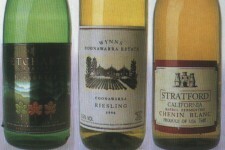 Australian Riesling is another favourite. The nose is intriguing: waxy – even soapy – with delicate, flowery notes. The palate is very full and luscious with good, vibrant, tropical fruit character, but it maintains an apple and lemon freshness. Long and nicely balanced. This Californian wine is non-vintage, which means it’s probably a blend of wines from the current plus previous vintages. That element of maturity, along with fermentation in oak barrels, explains the toasty, creamy, complex nose that leads to melon and lime fruit and a chewy texture. Very moreish. A wine with rich cherry and plum fruit on the nose and palate, it is soft and gluggable with no harsh tannins, though there is a squirt of lemony acidity in the finish. Good stuff to counter spicy foods. There is super-ripe loganberry and blackberry fruit on the nose and cool, peppery, berry flavours on the palate. It has a velvet texture and the finish is quite long with some oak and unobtrusive acidity. This is about as cheap as Zinfandel gets and would make an ideal introduction to the variety. In this world, you get what you pay for and I would happily splash out the extra on this gorgeous wine, which moves on to a higher plane of wine-making. Made from old vines, it has a sweet, sweet nose suffused with spice and summer fruits, black cherries and some earthy, leathery notes. It has jammy damsons and blackcurrants on the palate and a framework of tannins and soft acidity that leads to a long, gloriously ripe finish. It has years ahead of it too.